Dow Chemical registered chlorpyrifos in 1965. Around 6 million pounds are used nationally every year, and about a million pounds are used annually in California. Farmers use it to kill pests like ants, moths, larvae and worms on about 60 crops, including oranges, alfalfa and almonds. Chlorpyrifos is part of a class of chemicals called organophosphates, which can poison the nervous systems of insects and mammals. Sarin gas, the nerve agent used in chemical warfare, is also an organophosphate, though chlorpyrifos is much less toxic. At high doses, nerve agents like chlorpyrifos cause symptoms like headaches, nausea, dizziness and disorientation. If larger doses are ingested, it can lead to vomiting, stomachaches, diarrhea and even death. The EPA banned chlorpyrifos for the majority of home and garden uses in 2000 due to toxic effects on the nervous system. The agency has also restricted its use on a few commercial crops like apples and tomatoes. A few years ago the U.K. banned the chemical on nearly all crops. In March, the new chief of the EPA, Scott Pruitt, rejected the proposed ban, which had been recommended by EPA scientists. In a press release Pruitt said, "By reversing the previous administration’s steps to ban one of the most widely used pesticides in the world, we are returning to using sound science in decision-making — rather than predetermined results." He said the EPA would not make any final decisions on chlorpyrifos until 2022, pending the agency's further scientific review. Pruitt's actions outraged environmentalists and many scientists who have studied the chemical for decades. 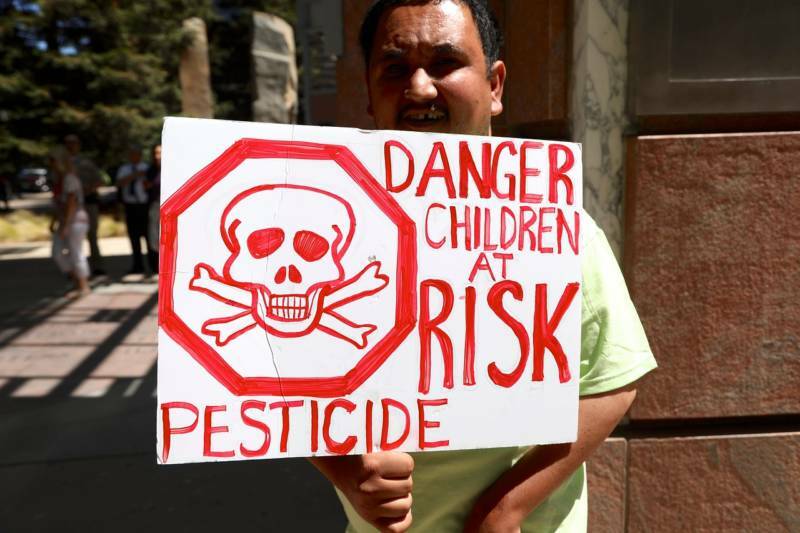 Activists were further angered this spring when the widely used pesticide Vulcan (whose active ingredient is chlorpyrifos) drifted from a field in Kern County over to a group of farmworkers picking cabbage. Five of them sought medical treatment. 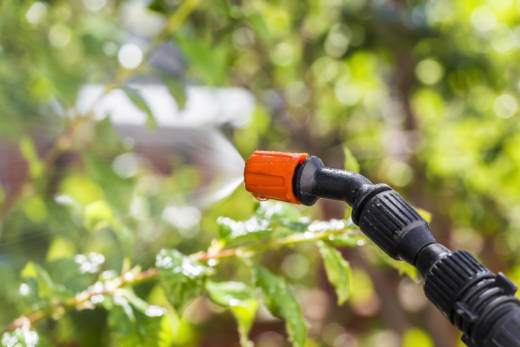 The California Department of Pesticide Regulation is in the midst of reviewing the science on chlorpyrifos to analyze whether a statewide ban is justified. California already had stricter rules related to its application than most states. For example, farmers must have a permit to apply the chemical; they must post a warning after they spray a field; and the state requires buffer zones between sprayed fields and human dwellings. Last week CDPR implemented even stricter rules while it completes its lengthy scientific review. The interim guidelines require greater distances between fields sprayed with chlorpyrifos and "sensitive areas" like homes. The distances are now up to 500 feet, about three times longer than previous requirements. But the enhanced mitigation does not satisfy activists. "We are calling on DPR to hit the pause button on continued use of this chemical based on what they know, " said Paul Towers of Pesticide Action Network. "They know it impacts children's brains -- the question is about what levels. So while we determine that through two different lengthy scientific bodies we should suspend the use of chlorpyrifos in California." When EPA scientists proposed banning chlorpyrifos in November 2015, their recommendation was based on the precautionary principle: better to err on the side of caution rather than putting anyone at risk. Towers is calling on state regulators to take the same stance to protect agricultural communities. Does the Science Justify a Ban? The majority of research available has looked at how exposure to chlorpyrifos influences the developing fetus rather than workers in the field. Research shows that prenatal exposure can lead to preterm births, abnormal reflexes in newborns, pervasive attention problems, motor control deficiencies and lower IQ. Scientists have also noted that some young children who have been exposed to the chemical have conditions related to compromised lung function, like asthma. Eskenazi also says chlorpyrifos is not the worst organophosphate used in agriculture; there are other chemicals that may be more toxic to human health. But environmentalists are targeting chlorpyrifos because it is one of the most widely studied chemicals in the world, even though there is still little research on whether residue in produce could impact consumer health. Dow Agrosciences says it remains confident that authorized uses of its product offer wide margins of protection for human health and safety. 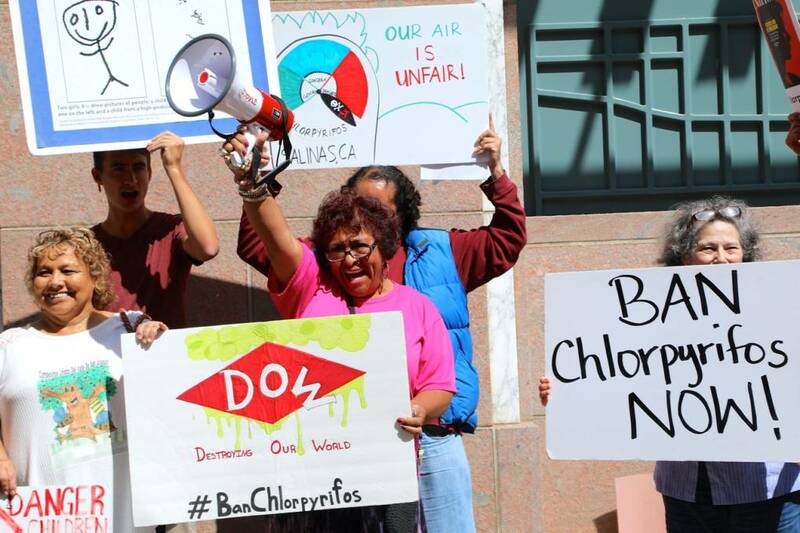 In a statement the company said, "Overall, more than 4,000 studies and reports have examined chlorpyrifos in terms of health, safety and the environment. No pest-control product has been or continues to be more thoroughly evaluated." Towers draws a different conclusion from the abundance of research. "If we can't act on this pesticide," he say, "what pesticide can we act on?"